Jan Ellis played the first of his 38 Tests as a flanker against the All Blacks in 1965 and only missed one match until he was dropped for good 11 years later. His final Test appearance, a 16-7 victory over the All Blacks in 1976, equalled Frik du Preez's then-record for test caps for South Africa and there was uproar when the selectors ditched him. He was born in Brakpan in South Africa but moved to Namibia as an infant and won a place at the Springbok trials after impressing for South West Africa against the Lions in 1964. He was renowned for his remarkable work ethic, the way he carried the ball in one hand, but also for his short fuse. He was something of a loner off the pitch, avoiding most social functions, and as a result had few friends in the game. 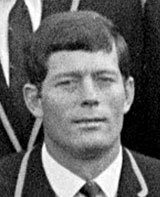 Ellis played most of his representative rugby in South West Africa ending it with Transvaal in 1975 and 1976. He was an auctioneer and then a garage proprietor. In 2000 he was shot and seriously injured in an armed robbery at his garage and his health never fully recovered.